In July 2011, the completion of a project to enhance the beauty of our church and improve the place as a vehicle for worship, became a reality for the future. The liturgical re-ordering at Christ Church is the culmination of a process which began before 2007. One of the outstanding features of the re-ordering is the new pulpit. The inspiration for the pulpit is two-fold. Firstly, it derives its form from the principles of Norman architecture, itself a development of the Romanesque form. The features of this style are evident in the church: arches supported on corbels, the geometric forms of decoration - 'dogtooth' on arches, and diamonds (note the pattern around the wall of our apse). 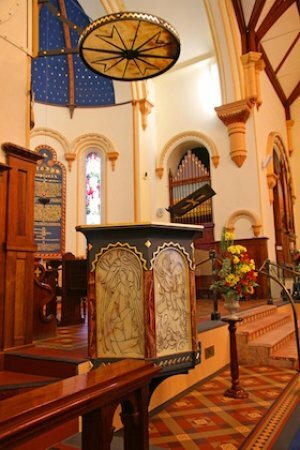 The pulpit is set on a corbel with four arched panels and gilded geometric patterns. At once I was in the Spirit, and lo, a throne stood in heaven, with one seated on the throne! And he who sat there appeared like jasper and carnelian, and round the throne was a rainbow that looked like an emerald.... And round the throne, on each side of the throne, are four living creatures, full of eyes in front and behind: the first living creature like a lion, the second living creature like an ox, the third living creature with the face of a man, and the fourth living creature like a flying eagle. And the four living creatures, each of them with six wings, are full of eyes all round and within, and day and night they never cease to sing, "Holy, holy, holy, is the Lord God Almighty, who was and is and is to come!" The panels on the pulpit are of onyx stone, and upon each is engraved one of the 'living creatures'. If you look, closely, each creature has a scroll, or book, for in Christian tradition the four living creatures have been identified with the four Evangelists (gospel writers): Matthew (like a man), Mark (a lion), Luke (an ox) and John (an eagle). The pillars separating the panels are of carnelian stone. From this pulpit is the Good News of Jesus Christ proclaimed with the intent of bringing worshippers to the heavenly vision. Above the pulpit is a 'tester' or canopy, originally associated with pulpits as a means of assisting sound to be projected into a building. It also has the visual effect of locating the preacher in a space. Like the pulpit at Christ Church, the principal stone, onyx, is used for the material of the tester. The method of supporting the onyx of the tester is a steel Maltese Cross. This feature has been used in the tester because of the association of the Venerable Order of the Knights of St John of Jerusalem with Christ Church, which is the conventual church of the Order in South Australia. The Maltese Cross is also known as the 'Beatitudes Cross', because it has eight points - the number of the beatitudes, or 'blessings' for the disciples of our Lord who perform works of mercy towards those in need or distress. It is the primary symbol of the Order of St John.